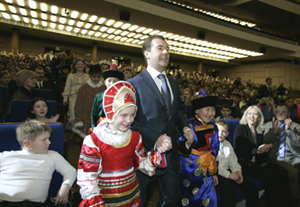 Medvedev's First Term: Will it Equal Putin's Third? Russian poet Evgeny Evtushenko once stated that "in Russia, a poet is more than just a poet." Vladimir Putin echoed these words in his inauguration speech in 2000, declaring: "a Russian president is more than just a president." Putin spent the next eight years realizing this conviction, debunking all the myths that somebody so closely tied to Yeltsin's entourage could not rise to become a genuinely popular national leader. In an attempt to predict Russia's course over the upcoming four years, political experts began asking the question "who are you, Mr. Medvedev?" immediately upon his nomination by Putin to become the next President. This question was reminiscent of the "who are you, Mr. Putin?" that dominated political airwaves eight years ago. The role of a leader's personality has enjoyed much greater historical significance in Russia than in the West. Putin's recent development of a `vertical power structure,' which placed most important decisions exclusively in the hands of the chief executive, greatly increased the dependence of the entire state apparatus on the president. Putin is not interested in destabilizing this alignment of forces and, for this reason, his choosing a successor followed the six `do nots' of power transfer in Russia: do not violate the course followed by the previous leader, do not ruin relations with either the East or the West, do not allow the country to slide back in history, do not allow a fragmentation of the country's elite, do not allow a security threat to develop (either to the country, or to the leader) and do not choose a successor obsessed with personal power. Dmitry Medvedev fits all the criteria, especially when he is backed by Putin in the Prime Minister's seat (a post he promised to occupy after stepping down from the presidency). This is the most interesting facet of his current predicament. The President has not revealed the motivation behind his decision to exchange the role of a `popularity god' for one of a simple bureaucrat. The tasks associated with a Russian Prime Minister - traveling around the country, supervising social programs, reporting to the new president - seem mostly mundane and routine compared to those of a president. Putin's decision to submit himself to these chores seems logical only under two scenarios. First, the new President could resign at some point in the future. New elections would be scheduled within three months, and Putin's participation in them would fully comply with the constitution. However, this course of events seems a little extravagant, even for Putin. He has repeatedly said that making plans for a return to the presidency, especially in Russia, is a futile task. For this reason, the second scenario is more likely: Putin could assume the job temporarily to smoothen the transition to a new national leader, thereby pacifying the security structures and other members of the elite. This has already happened at least once during Putin's tenure as president: in 2000, he appointed Dmitry Medvedev First Deputy Chief of the Presidential Administration. After a four year "training course," Medvedev had developed his own style of leadership and was promoted to head the administration. During the years that he ran the show in the Kremlin (2003-2005), the country also changed significantly as government objectives were transformed to focus on high levels of economic growth and development. The same will happen after the March elections; Medvedev's first term will not be a continuation of Putin's second term.